…and so she returned to her computer after a long silence…hiiiii! Here I am again! How are guys? How’s spring looking in your kitchen? All the ice cream business has taken most of my time during the last few months, but now I’m back on my blog! And it really does feel nice to be back here, in my small little internet world. To celebrate all that’s happened I brought some treats…and it’s ice cream! What else, haha. 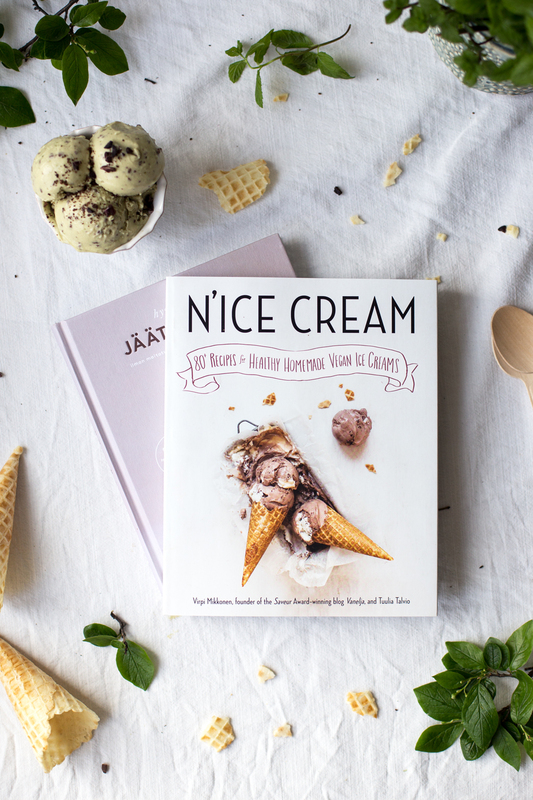 But really, today’s a day for celebration as our N’ICE CREAM -book is OUT today in the States and in Canada, yay! It feels kind of weird to be on the other side of the globe and only picture my and Virpi’s book in the stores. But there it is, sitting on the self among other cookbooks. Or maybe it got to be on a table? As I’m not physically there to see the book (at least not yet), I’ll just go with my vision of the book having a blast in the stores and making people stop when they see it, and then they have to read it. I really do hope that it will make people go crazy for vegan, good-for-you ice creams, and that it will have very many happy new owners all over the world. At least here in Finland people have gone nuts for the book, as we were sold out in a week! That’s crazy, and it makes me so so happy. THANK YOU guys! So let’s move onto the treats I have here with me. 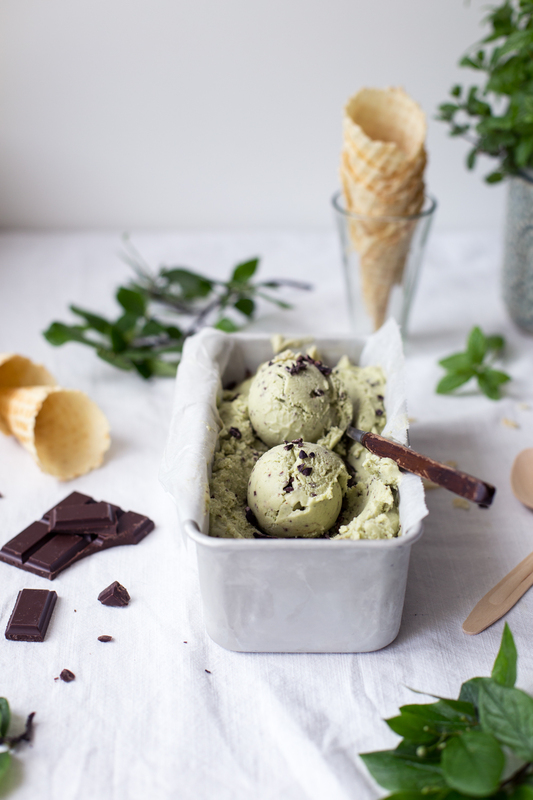 Let me present: Vegan Avocado Mint Chocolate Chip Ice Cream! A true classic flavor with wholesome, good-for-you ingredients. The base is made with avocados, coconut milk, and mint and the end result is very creamy, super fresh and naturally with the chocolate chips, a bomb of deliciousness. And even if you’re not a fan of avocado or coconut milk, don’t worry, the mint is so strong and fresh that you won’t even taste the avocados or coconut. So what else did I have for you? Oh yeah, a giveaway of the book! To celebrate spring and summer, I’m giving away one copy of the book. Just write a short hello to the comments below and you’re in! You’ve got time to participate until Sunday the 22nd of May. And the giveaway is this time open to US & Finland only. Good luck! EDIT: The giveaway has ended, thanks to everyone for participating! It’s going to be super exciting to see what kind of adventure our book will have, but I’m already so happy and grateful for the experience we’ve had, it’s been a true adventure. Open the coconut milk cans and scoop out only the thick, solid white cream into a blender. Add avocados, rice syrup, peppermint and fresh mint and blend until smooth. Add the cacao nibs/chips and stir with a spoon. Melt the coconut oil and honey / syrup in a small saucepan on low heat. Add the cacao powder and salt and whisk into a smooth sauce. Serve and enjoy with the ice cream! And hey! If you’re in need of some summer tunes, check out our N’Ice Cream -playlist, which is perfect for all the picnics, parties and get-togethers this summer. And feel free to follow me on Spotify for some of my favorite playlists! Tagged chocolate, dessert, ice cream, nice cream book, nut free, summer, vegan. Hei. Olet ihana. Jätski on hyvää. Ihana kevät myös! yayyyy mahtavaa!! herää into mennä vähän mönkimään keittiön kaappeja ja pistämään jädeä tulille (heh). ihana uutuus! Well hel-LO!!! Such an interesting book! I made today ice cream by using oat cream. Works really well!! Congrats! I would love to get into the secrets of that book! Hi I just came across your blog and your ice cream looks amazing. I am not vegan but my sister and I are dairy intolerant so we love making anything vegan. We have a blog as well but we have never made ice cream! And yours look incredible. I really want to make different types of healthy ice-cream for my friends and family back in Hong Kong. Moi, nämä jätskit näyttää super herkullisille! Voi nam! Minttusuklaa on suosikkini! Upeaa, kun kirja ja sen hyvyydet leviävät ympäri maailman! Onneksi olkoon. :) Jäätelö on eräs hienoimpia asioita. Terveellinen jäätelö ehkä hienoin. Kiitos. 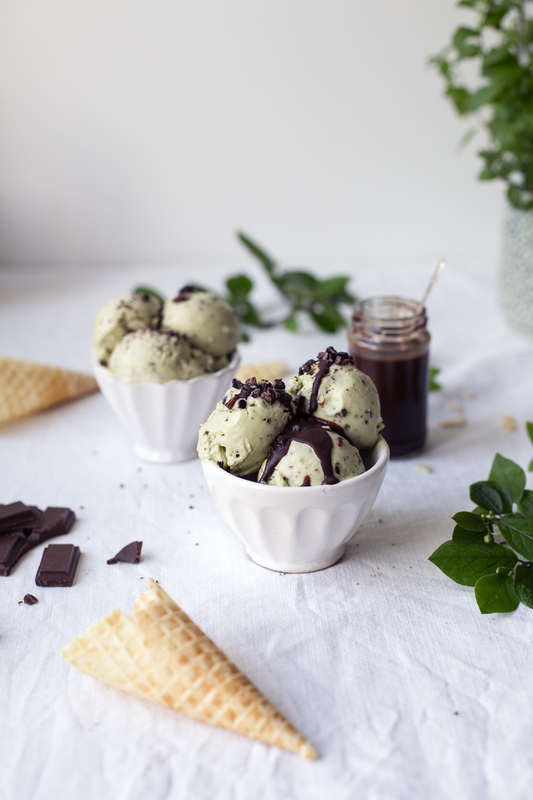 oh this mint chocolate chip ice cream looks amazing!! can’t wait until the weather warms up…. Onneksi olkoon vielä kirjasta! Älyttömän hieno homma!! En malta odottaa että pääsen kotiin blenderin ääreen testailemaan näitä jätskejä! Your blog is amazing. I recently went vegan and giving up ice cream was so hard. Then, I found your blog :) thank you so much! 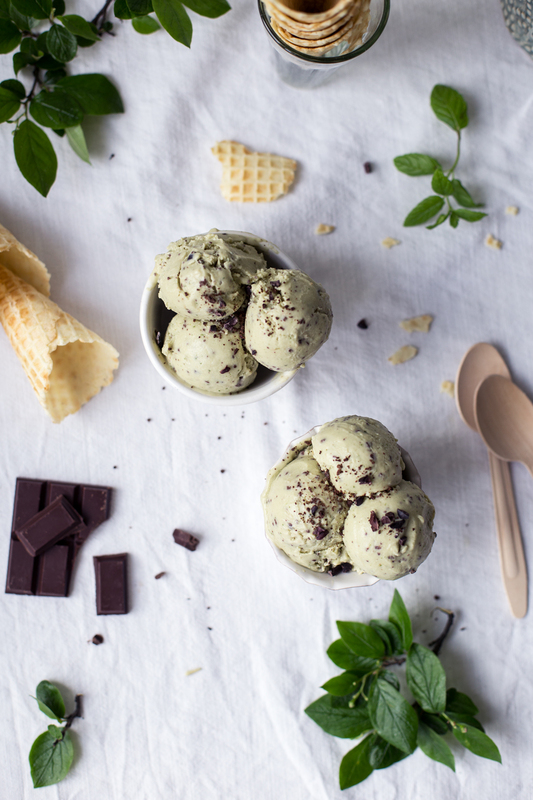 Just came across your website tonight and made this ice cream—so amazingly delicious! Thank you for being a resource to those of us who, by choice or by necessity, need allergy friendly recipes like this. SO much better than store bought vegan ice cream, and I love knowing exactly what goes into it! I have a friend in Finland, I am sure she will be so happy to receive this gorgeous book! 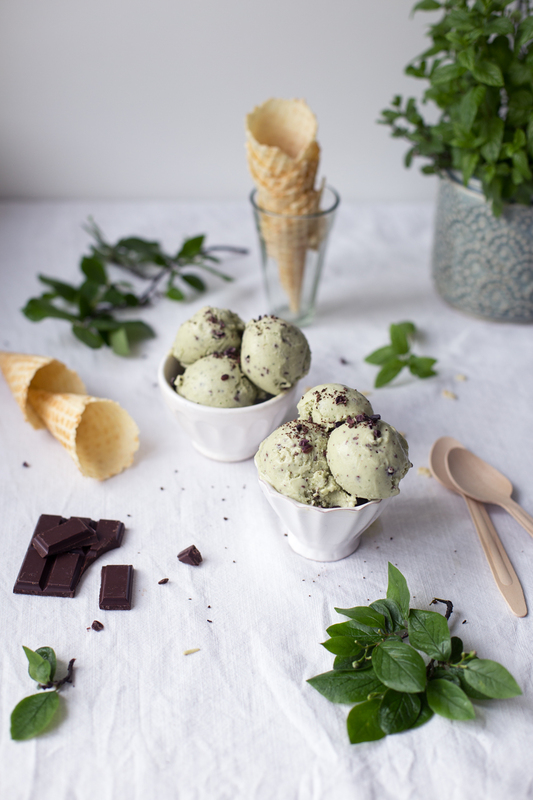 I can’t wait to try this, mint chocolate chip with fresh mint is one of my favorites! I love ice cream! Jäätelön täytteistä kesää..
Hello! That looks so yummy!!!! Heeiii ihana kirja, olisi aivan mahtava kokeilla näitä reseptejä! Hello! Can’t wait to try this recipe & make treats from the book!! Yum! hi!!! congrats on the book coming out. one of my favorites – great to see it in a nice version. These recipes look AMAZING. Thank you for sharing! Hello from Sydney, Australia and congratulations on your book!